113469 visits since Jan. 2007. Today, the oceans experience an exceptionnal tide: Sun, Moon and Earth are aligned (an eclipse is visible from some places), plus the moon is closer to us than usual and it is the spring equinox time. As a consequence the tides will be very low in some places, and 6 hours later very high! It is a rare opportunity to explore the coast as some areas usually under water will be dry ! but be careful not to get trapped by the raising tide. I just added a long developpement work to the interactive plates: now, you will be able to filter the species plates by shell general shape. This feature is added to the already existing filter abilities. 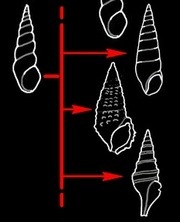 With this addition, Conchylinet has now an unique and powerful tool to help with the identification of the shells. Click here to have more details about this new and unique feature, or start to play with it from the species interactive plates. These filters will become more and more efficient with the continuing enrichment of the species diversity and distribution recorded in the database. I have compiled a list of species I could observed and identify from the sand collected by Cristobal Colon vessel (see previous news). You can access the PDF file HERE. Feel free to send comment about it. [2013-01-05] Keep an eye on dredge sands! First, I wish 2013 to be better than 2012 for you, of course with plenty interesting mollusks discoveries. By the end of 2012 I had the chance to be in Seychelles where I learnt about an industrial dredging operation that occurred 1 year ago. After some investigations, I could visit the massive sand stock pile which was about half a million cubic metres! 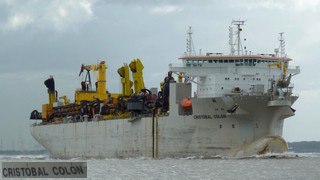 It has been sucked off Mahé island about 50m deep by the Cristobal Colon giant dredger vessel in two days. No need to say that searching the whole pile was impossible but within a few hours and dig out a few species in decent conditions. They mainly consisted of bivalves dominated by Chlamys senatoria specie and Cucullaea labiata. Keep checking the site as I will do soon an update with illustrations of these species and the others. The interactive plates have been once more upgraded: the ability to filter the collection at the order taxonomic level has been added. Thanks to it, families group can be queried together. For example, you can select the Nudibranchia order which will show only the species of the families belonging to Nudibranchia. Do not hesitate to play with it and share any classification mistakes you could detect. Thank you. As a number of nudibranchs species have been observed (and photographied), I decided to add this group of gastropods molluscs to Conchylinet. Even if nudibranchs are shell free and seem exotic for this website, they still are marine gastropods and some of them have shapes and colour patterns as extraordinary as the most wonderful seashells. Below are the direct links to the only 3 family available today on the site: Elysiidae, Phyllidiidae and Chromodorididae. Of course, these families become available from the interactive plates. All pictures of Terebridae species (genus Hastula, Duplicaria and Terebra) have beem modified to improve the view of these high and narrow spired shells. Former view presented the shell with the apex on top, now the shell are horizontal wich improve details on 4:3 format pictures as illustrated below. Conchylinet is proud to annouce that the number of species illustrated on the site has reached ONE THOUSAND! That number is roughly made of 360 bivalves and 640 gastropods. Of course this is still a very small figure compared to the worldwide diversity of mollusks (about 100 0 00species) but it shall enable you to see and compare most common shells that you may find during your shelling activities. However, some geographical areas are under-represented such as Western Africa and WesternCentral America. If you can collect common shells from these places, do not hesitate to share your data. The 2010 visits report is now available. Click here to view it. 1. More countries are available in the country listbox. These few countries are listed out of the database because they reached a specific number of species observed. This is completely arbitrary, again more observations contributions would enable more countries. e.g: Selecting sizes between 120 mm and 500 mm will filter the list of families where at least one specie has reached 120 mm. e.g: Selecting a province will filter the list of countries where the countries belong to that province (note that a few countries, such as USA, can belong to more than one province). 3. Plate setup options have been upgraded with the possibility to display the quick info box. This little box is colored according to the province, and the size category of the species is displayed inside. Its legend is given here. Leaving the mouse cursor upon it will reveal its content. The 2009 visits report is now available. Click here to view it. 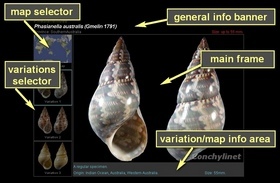 Today a major enhancement has been done to Conchylinet: variations and distribution maps have been added on each specie description page. The variations are extra photographs to show other forms or colorations of the same specie. Now, just a few variations are online but expect to see more later on. The distribution map is another Google Maps screen which displays dots on the world map. Each green dot is an occurrence of the specie recorded in Conchylinet database. The map is auto scaled to optimize the view of the distribution. But you still can zoom in, zoom out or pan to watch specific/closer area of the map. [2009-07-14] Warm welcome to the clams! Today I am pleased to announce that almost all the Veneridae has been re-photographied and are uploaded on Conchylinet. Veneridae is an important family of bivalves which represents almost 25% of the total bivalve species number of the collection. For an easy browsing, choose the interactive plates and select Veneridae in the family dropdown listbox. Do not hesitate to bring your feedback. And if you detect errors in the ids - especially within the Northeast Atlantic Venerupis, Tapes, and Paphia genus - I would be grateful to know about them. Due to the number of species recorded from Mauritius, I added a special plates tool for the species coming from that country. These plates include Mauritius island and Rodrigues island species. The details provided for each of these species will be added along with the relevance of data collected from the field (such as depth, abundance estimate or habitat). I hope to make these 3 available on the popup details by the end of September 2009. UPDATE: The Mauritian species plates are now available from the general species plates, just select MAURITIUS in the country dropdown list. A short notice to inform you that Conchylinet visits summary reports are going to be online. It has been made possible thanks to XiTi (Website auditing tool) which collect data about visitors. The first report (year 2008) is now available. Click here to view it. A short trip to Rodrigues (a small mauritian island in south western Indian ocean) allowed me to observe some seashells. I was pleased to see a lot of live and beached species, but I was surprised not being able to spot a single Nerita polita	. It is a small but attractive littoral specie which shell displays a wide range of colours and patterns. I went to the same sites about 6 years ago and this specie was common. I would like to be wrong, but what could be the reasons of this decline? The first interactive map feature has been added thanks to the excellent Google Map API that enable an easy embedding of geography tools on web sites. Beware, Google is everywhere! Hence, the section collecting sites has been improved. On that 2.0 version, the page displays a map with all locations where shells have been reported, some of them have a picture or a detailed collect reports. The most interesting thing about that is that you will be able to see what regions compose the specie diversity of Conchylinet, aswell as missing regions. Do not hesitate to bring me your feed back about this feature. [2008-01-06] Happy new year 2008 ! - A lot of species mainly from the Indopacific province (mainly from Mauritius) have been added. - The Collecting section is up and running. If you are a beginner collector , you may perhaps find some collecting tips and advices there. - The Interactive Browser has been improved. - A few more sections have been translated into French. Enjoy your visit and do not hesitate to bring your feedback! Sorry for the lack of recent updates and news. I have moved to Mauritius and should be in this country for some time. The next Conchylinet updates will deal with Mauritian species. Note that most of the species of Mauritius occur also in the whole indopacific's province. A country parameter will be added on the interactive browser enabling to select Mauritius shells. On September 2006,Two dead tropical seashells have been found on the Atlantic coast of France. The first is a Cypraea moneta	found amongst native shells on a beach of the Bordeaux area. It is an Indopacific specie. Has this shell been dropped by somebody ? Or by a vessel from this province ? The second is a Nerita virginea	whose shell has been beached in southern Brittany next to Carnac. It is a very small specie that occurs in the Caribbean province. Again,how this shell has landed here ? Can the currents carry a shell from Caribbean to NE Atlantic ? Has it been carried by men ? Last possibility: a population is settling in this area and then live specimen should be found. Anybody who experienced similar facts or who can provide more information on these kind of occurrences is welcome to share it ! [2006-09-28] Conchylinet is online ! Conchylinet has been brought online on 2006,September 28th. It is only on its first version. You will find bugs and bad English. But please be indulgent when visiting it. Furthermore, I am just starting to learn about website building, and languages like HTML and PHP are very new to me. Conchylinet will be enhanced little by little according to the time I can spare on it and of course to your interest for it. Any suggestion to improve it are welcome.